As Murr is still off on his long weekend in Stockholm and I’ve just got back from the Edinburgh Fringe this weeks Geekly Review is a little quieter. I’ve been following Escape from Tarkov pretty much since early last year and now that the game has gone in to Beta I decided it was a good time to jump in a try it out. 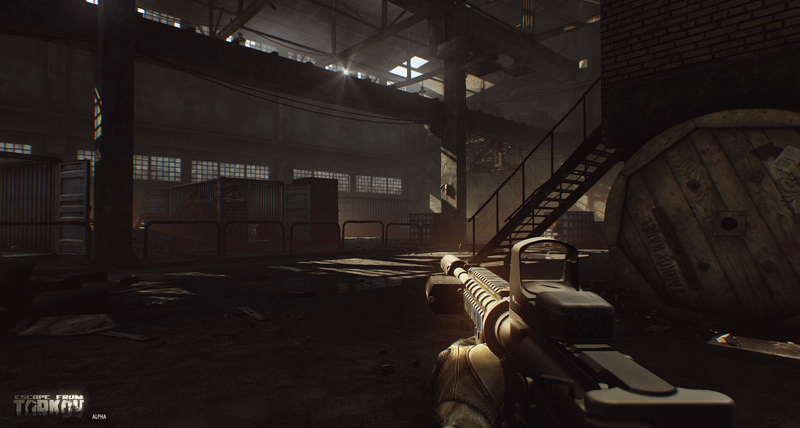 Escape from Tarkov is an FPS MMO with some RPG elements thrown in too. In it’s current state there are a few maps to explore with the Shoreline map being the most recent one. Essentially when you spawn in the game acts a bit like a mix of, deathmatch, a raid, and a battle royale. There will be other players you’ll have to look out for as well as AI enemies, your objective is to search around for loot, or pick it from the corpses you drop and then get out with it. Eventually there will be story missions and I believe that all the areas will be connected so it will become much larger open world. The game looks pretty stunning and the sound effects are just as good if not better. The gameplay is probably some of the most tense gameplay I’ve experienced too as you can quite easily lose any loot you have on you. Night time in particular is very scary and if you don’t have a torch you’re going to struggle to see five feet in front of you. One particular moment stands out for me when I was playing on the Factory map – a completely indoor map with close tight corridors and narrow tunnels that run underneath large open industrial areas. I was making my way through the office area of the map and noticed a dead body, by this point I had some loot and was looking for the exit – I didn’t know where it was. I cautiously approached and then heard footsteps at the other end of the corridor, I quickly ducked in to a room to wait it out and see what happened. The footsteps went silent and then a few seconds later I heard gun fire. Eventually I popped my head out of the room and started to make my way down the corridor and a head emerged from the other end, I took shots and they ran off, but I also got hit and was hurt with no medical supplies. My vision was starting to go black and red at the edges as I made my way down some stairs towards what I thought was the exit. I found myself at an open area with a large red door the other side of the room – an exit! At this point I couldn’t run as I was so injured and I could barely see with my character grunting with every step I took. I reached the door and BANG! I was shot in the back. It was extremely intense and the whole time I had a fear of getting killed and losing my gear – something that a lot of other games don’t make me feel. Outside of the gameplay there is an economy where you can buy and sell all manner of loot, weapons and armour to gear you up for your next raid. I also put together a video of my playing on the new Shoreline map. 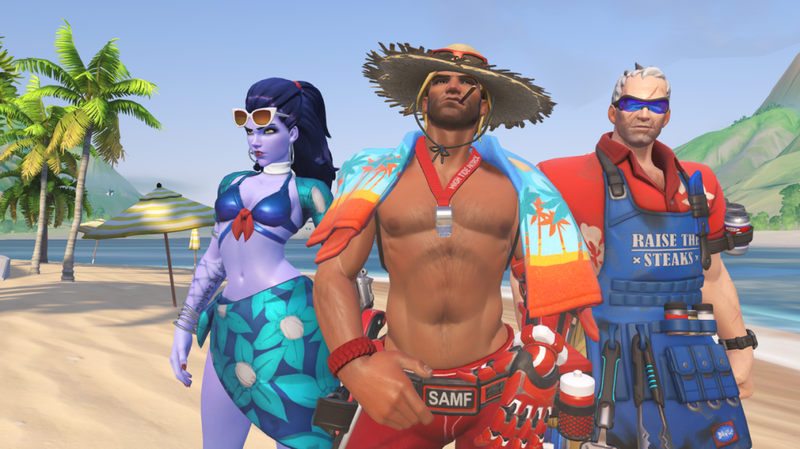 The summer games is back in Overwatch and that means new skins, emotes, sprays, voice lines etc… to collect. It also means that Lucio Ball is back. When the summer games hit last year I didn’t spend all that long playing Lucio Ball and now I know why. Let’s be honest here, it’s a pretty rubbish game mode filled with glitches and bugs, I’ve had numerous games where the ball has glitched through the map and never come back, the hit detection feels off, overall it just feels a bit weak to me. For some reason they’ve now made it competitive too… Whilst I think it’s good you can earn competitive points from playing it, I just don’t think it needed to be added as a competitive mode – especially with the bugs in it. Some of the new skins however are super cool and I’m definitely going to be trying to get some although so far all my loot boxes have contained disappointment. I think I will just stick with quick play though and maybe only play Lucio Ball for a few quick and easy loot boxes. I got to putting together some first impressions of the Mars survival game ROKH, you can check them out here. It’s a little rough around the edges in places, but it does have some promise. Murr posted his review of the brilliantly fun King of Tokyo last week – again you can read that here.